We are able to supply a wide range of hospitality uniforms which include hotel uniforms, restaurant work uniforms catering uniforms and in a range of colours. Quality hospitality workwear that wears well and washes easily maintaining a fresh image for staff who are working front of house meeting and greeting guests to staff working in the kitchen. Cleaning staff uniforms and housekeeping staff uniforms can include t shirts, polo shirts, tabards and aprons. Care Home owners and healthcare sectors can be supplied with staff uniforms and tunics which include contrast trim options with different colour options to distinguish between general staff and supervisors. From short sleeve blouses to long sleeve tailored shirts. We have a good range of garments for you to choose from for your front of house staff uniform requirements. Custom bar staff t shirts, custom bar shirts and custom bar aprons made specifically for bar staff now come in a range of styles and colours to create a modern sleek look for your business. Beauty Tunics, Ladies Tunics and Mens Tunics come in a range of colours to help all health and beauty staff look coordinated in your health spa or resort. Modern Spa uniforms with your logo are available in a range of fabric option to create a luxury spa experience for your clients. Custom Chefswear embroidered jackets and other catering uniforms can be personalised for you with bespoke embroidery logos. 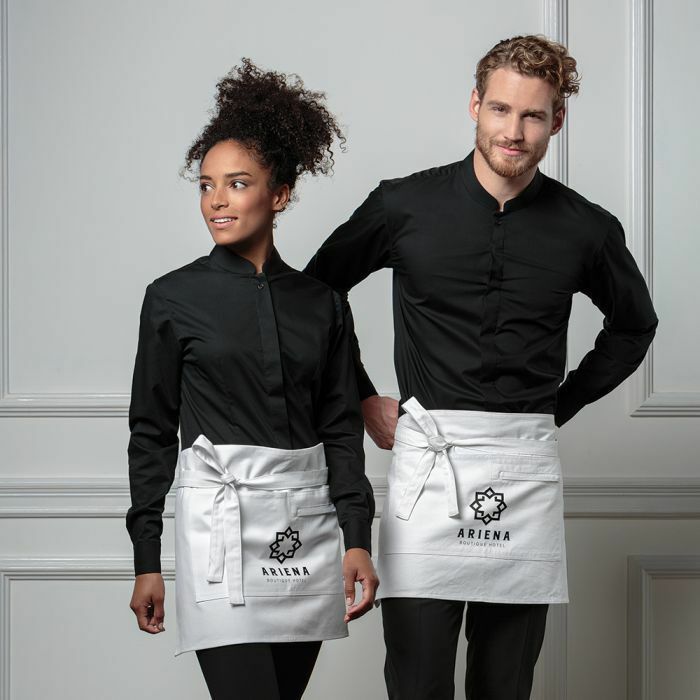 Restaurant staff uniforms with bespoke blouses and bespoke shirts can also be supplied with embroidered aprons to help create a consistent look throughout your business. Let's Get Started With Your Hospitality and Catering Enquiry Today! All you need to do is click the button below and send over a few pieces of information to us for your hospitality and catering uniform requirements and we will respond to you as quickly as possible.